Why Are Jews Still Living in Malmö, Sweden? 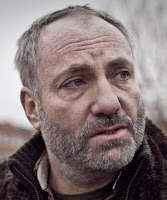 Kim Bodnia, Jewish star of the successful TV series 'The Bridge,' left it because he did not feel safe filming in Malmö. A leader of the Jewish Community of Malmö, Sweden, reacted badly when a Jewish TV star revealed he had quit a successful series because of the discomfort he felt when filing in Malmö. Kim Bodnia, the Danish-Jewish star of the Scandinavian crime drama "The Bridge" ("Broen / Bron" in Danish and Swedish) had said he quit the show in part because he did not feel safe filming in the Swedish town of Malmö. It’s not very comfortable to be there as a Jewish person. So of course this has something to do with why it’s easy for me to say no to working in Sweden," he added. here,” Peres said at the synagogue. “We never dreamed that state we created would be bigger than Norway, and a pioneer in technology and science." "Being used in a politicized discussion??" Since when is the safe of Jews, nothing more than a politics? There is not really much else to comment on this report. Contract disputes or not, I say good for Kim Bodnia, and shame on Malmö's Jewish community "leaders." It is well-known that Malmö is one of Europe's biggest and most problematic, Islamic thorn in its side. Bosnia and Albania are Europe's Muslim countries, yet they cannot hold a candle Malmö's developing Islamic enclave. Of all countries in Europe, of all cities in Europe, what Jew in his right mind would actually want to remain living in Malmö, Sweden? Unfortunately, the reaction by the "leader" of the Malmö Jewish Community, to Bodnia's comments was hardly surprising. Furthermore, ...when [Bodnia was] asked about his religious beliefs in 2011 he said that he has "None, other than that I believe in nature". But, the Islamic problem has definitely been building up in Denmark, as well. So, why should Bodnia, one who does not identify religiously as Jewish, be able to see what the Malmö Jewish"leadership" cannot, or does not, want to see? Perhaps Bodnia just has more common sense than they do. I was born and raised in sunny and multicultural, Southern California, the land of movie stars and suntans. So, I get the appeal of remaining in galuth (exile). But, if the mosque and Muslim owned grocery store, three blocks from my apartment had come even close to showing the signs of Islamic radicalization and local takeover in Malmö, I would have left much sooner than I eventually did. Do you know who else apparently has more common sense than the Malmö Jewish "leadership?" Rabbi Chaim Katz, a former Chief Rabbi of Sweden. Both he and his brother, Rabbi Aharon Katz, one assistant to the Rosh Yeshiva of Merkaz HaRav Kook, Rabbi Avraham Shapira ztz"l, knew enough to leave, an that Eretz Yisra'el (the Land of Israel) is the homeland of the Jewish People, not Sweden. Another prominent Scandinavian rabbi did the same, Rabbi Michael Melchior, a former MK (Meimad/Labor). Born in Denmark, Melchior served as Chief Rabbi of Norway. Once again, we see the Jewish galuth (exile) mentality at its worst. Let us hope the Jews of Malmö, and elsewhere in Scandinavia wake up, before it is too late. Needless to say, the first step is for them to ignore their so-called "leaders."